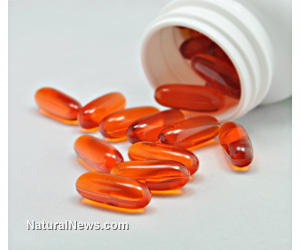 (NaturalNews) Omega-3 fatty acids from fish, walnuts, seeds and supplements have been shown to effectively protect against many forms of cancer, cardiovascular disease and dementia, as the long-chain fats are preferentially channeled to form cell wall membranes that fight systemic inflammation and boost the body's immune response. The typical diet is dangerously deficient in omega-3 fats, as they become rapidly degraded through food processing and are grossly imbalanced with omega-6 fats to create a metabolic environment that has been shown to promote disease. New evidence has recently been published in the American Journal of Clinical Nutrition by a research team from The University of Manchester in the UK that demonstrates how taking omega-3 fish oils could help to protect against skin cancer. A study team has just carried out the first clinical trial to examine the impact of the fish oils on the skin immunity of human volunteers. By analyzing the effect of omega-3 fats on 79 healthy participants, researchers found that taking a regular dose of fish oils boosted skin immunity to the sun by lowering sunlight-induced suppression of the immune system, known as immunosuppression, affecting the body's ability to fight skin cancer and infection. Lead study author, Dr. Lesley Rhodes noted "This study adds to the evidence that omega-3 is a potential nutrient to protect against skin cancer... they suggest that a continuous low level of chemoprevention from taking omega-3 could reduce the risk of skin cancer over an individual's lifetime." Volunteers for the trial took a daily four gram dose of omega-3, equivalent to about one and a half portions of oily fish, and were then exposed to the either eight, 15 or 30 minutes of summer midday sun using a special light machine. The supplemented group was then compared to a second group taking a placebo. Researchers found that immunosuppression was 50 percent lower in people who took the supplement and were exposed to eight and 15 minutes of sun compared with people who did not take the supplement. The team concluded "Skin cancer has been one of the fastest growing types of cancer, and numbers will likely continue to increase. It is always exciting to see research that generates such promising results, and we look forward to seeing future developments in this area." In light of the multiple functions and diverse type of disease processes that are prevented by omega-3 fat supplementation, nutrition experts recommend daily intake of 1,200 to 2,400 mg (combined DHA and EPA omega-3 fats) to promote optimal health and longevity.